The missing AR-15 of La Planta? La Planta jail riot and eventual closure keep revealing the inner workings of the regime. And it is not flattering. After all, when you accept to "negotiate" with hard criminals, when you allow them to take their goodies with them, when you allow them to pick the seclusion center where they will be transferred, you only acknowledge one thing: you are of the same nature than the criminals you are "negotiating" with. This was not a negotiation between the judicial system of the republic and inmates that may or may not have justified demands. This was an agreement between two type of gangsters so as to diminish the public impact, in order to keep doing business. And today the regime keeps giving evidence of being such a gang. Not only with La Planta sequels but with the return of Loyo to office! The latest in La Planta comes from two unbelievable news. First, Chavez himself acknowledged that he took part in the negotiations with the inmates. As far as I know it was not necessary for him to talk to them. 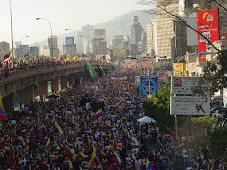 True, in any protest in Venezuela they demand that Chavez himself shows up. He never does and when eventually someone high enough appears with a wad of banknotes or a few cans of tear gas all goes back in order, provisionally at least. That Chavez talked with La Planta can only mean one of two things (AND/OR remaining possible, of course). The first hypothesis is that La Planta had become such a major problem at the level of the military (after all, some of them are responsible for the situation having gone so bad) that Chavez had to intervene from his death bed. The intervention was not for the welfare of the inmates or the neighborhood, no matter what chavismo pretends, the intervention was to avoid damaging internal bickering inside chavismo. The second hypothesis is even worse: Chavez thought normal to negotiate with these people because after all they, with their relatives, are voters and there is nothing wrong with them besides that they got caught. In case you do not get my above point: there are two type of criminals within chavismo, those who get caught and those who are not and thus stay in public office. Which brings me to the second part of this post. To highlight the above I must tell you that I am flabbergasted at the return of Juan Carlos Loyo to office. In case you already forgot who the guy was, he was the director of the INTI which is the organized robbery branch of the government as far as agricultural lands. There, he distinguished himself in robbing Diego Arria from his farm La Carolina. As a promotion he became agriculture minister when Jaua was promoted from that ministry to vice president. In that position Loyo presided over the take over of AgroIsleña and its dismemberment. I know that in some branches of Agroisleña they even stole the bathroom fixtures. The now "Agropatria" is so depleted of resources that the regime is negotiating to call back the ex owners, finally pay them something as long as they help Agropatria function somewhat and compensate the disaster its nationalization brought to Venezuelan agriculture. Another high feat of Loyo was when he showed himself for the take over of prosperous farms in Sur del Lago, red shirted Che, gun at his expansive waist line. The perfect chavista mafiosi. Needless to say that agriculture took a nose dive in Sur del Lago, adding to the end of maintenance of flood controls bringing back flooding in recent weeks. See, farmers used to take care of some of these controls and the new state controlled farmers are more interested in Chavez reelection campaign than maintenance. So, a guy of proven incompetence, of public display of banditry, fired by Chavez 5 months ago, is back as nothing less than Executive Secretary of the Planning Commission, the guy in charge to coordinate and execute the planning of the country's economic and infrastructure development, or who knows what because today in Venezuela the only thing you know for sure is that all of these Comintern are there to allow for legal sacking of state resources. The mind reels. We are indeed in the hands of a narco-mafia. here is something interesting.. Hugo has not sent out any tweets (as shown on his blog) since 5-13... gosh if we ONLY knew what they are up to..and what his REAL state of health is! I, for one, do not care. He is sick, period. The third possibility is that he did NOT talk to them & it was just a montaje so that we would think that he is in good enough shape to do something like that. Where are all the guns & rifles that we all know were in the prison. As far as I've seen they were not shown in public. They talked about the grenades because they had to blow some of them up - but the guns??? What were they promised?? That the guns would be re-delivered to their new prison? Lot's of questions - few answers. The return of Loyo is a complete travesty - he should be in a prison. Does any of you really think Chavez negotiated with the pranes. Come on, HE IS DYING!!!! As for Varela, the best she did in her job was to take that picture in bed with a pran. Puta Chavista. An act that lurks in the system without noticing by many. Ministra Varella - Where are they?